Board of Directors - Isabella Citizens for Health, Inc.
A unique aspect of all community health centers is that the Board of Directors is consumer-driven. Greater than 50% of the board members must be consumers of the health center. At each monthly Board meeting, the insights of these patients provide us with a valuable perspective on our operations. The 11-member Board is responsible for ensuring that the Center complies with Federal, State and local regulations and is financially viable. With different skills and backgrounds, our Board Members work together to make decisions on how our organization can best serve our community. Board Members are not compensated and volunteer their time. We are grateful to them for their dedication of time and talent. Mrs. Lee has been a member of the board since 2010. Mr. Wybenga has been a member of the board since 2012. Mrs. Barton has been a member of the board since 2010. She works with the Isabella/Gratiot RESD in Special Education. Ms. Albrecht has been a member of the board since 2013. She is retired from Central Michigan University. She is also the Organist at St. Johns Episcopal Church. Mr. Bloem has been a member of the board since 2010. He is a Public Defender and Attorney in Mount Pleasant. Mr. Hall has been a member of the board since 2014. Mrs. Hadden has been a member of the board since 2018. She is the Executive Director of the Mid Central Area Health Education Center. Mrs. Steslicki has been a member of the board since 2013. Mr. Kulick became a member of the board in 2016. Mr. Ross became a member of the board in 2016. 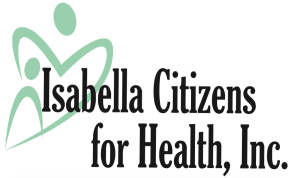 Ms. White has been the Chief Executive Officer for Isabella Citizens for Health since 2012.